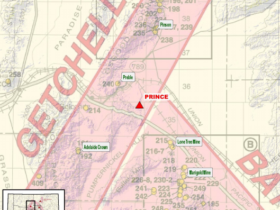 The Prince Claims are located just north of Interstate I-80 approximately 22 miles east of Winnemucca and east of Golconda Summit in the Iron Point Mining District. The property is situated at the north end of the Edna Mountains, west of the Humboldt River basin. 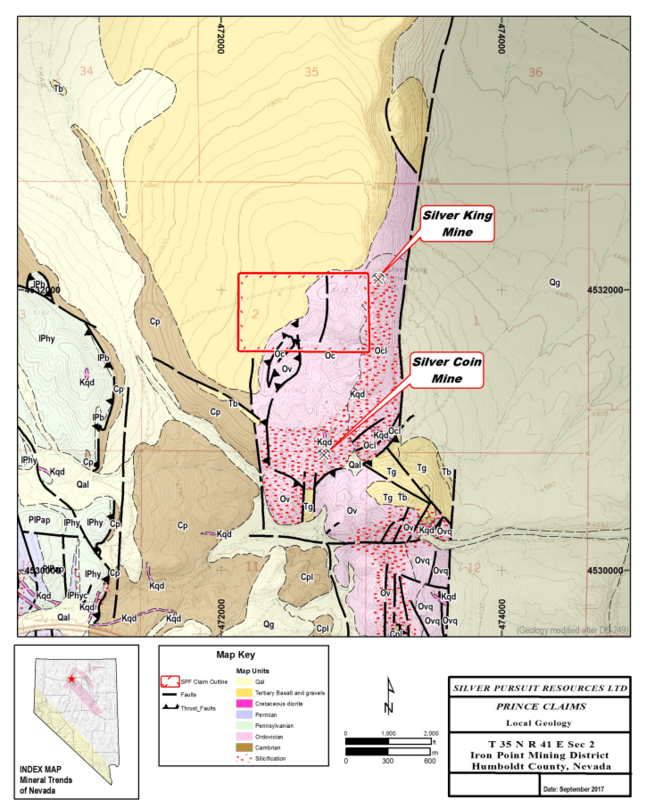 A total of six lode claims are located on the projection of the altered zone that historically produced the silver ores. 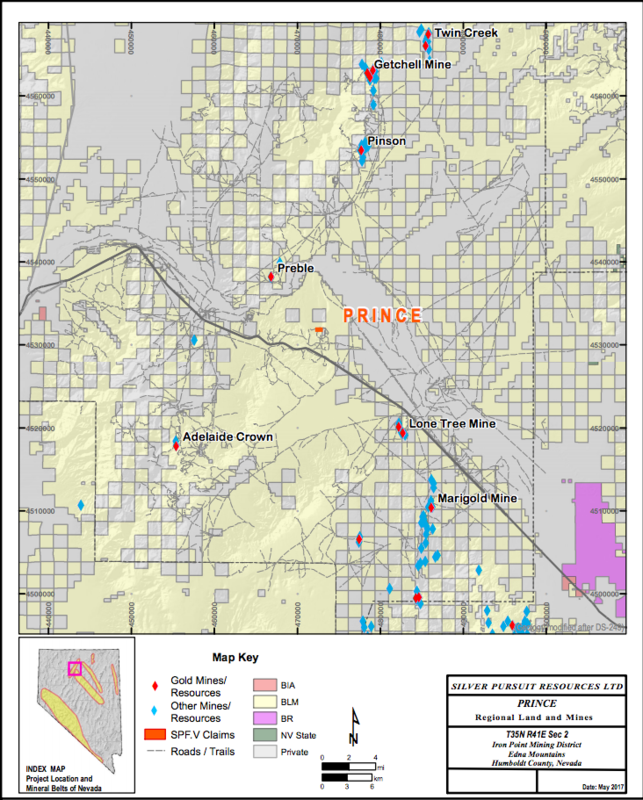 Precious metals as high-grade, polymetallic veins in the near-surface environment; deep targets for disseminated gold mineralization in a zone peripheral to the more silver-rich zones previously mined. 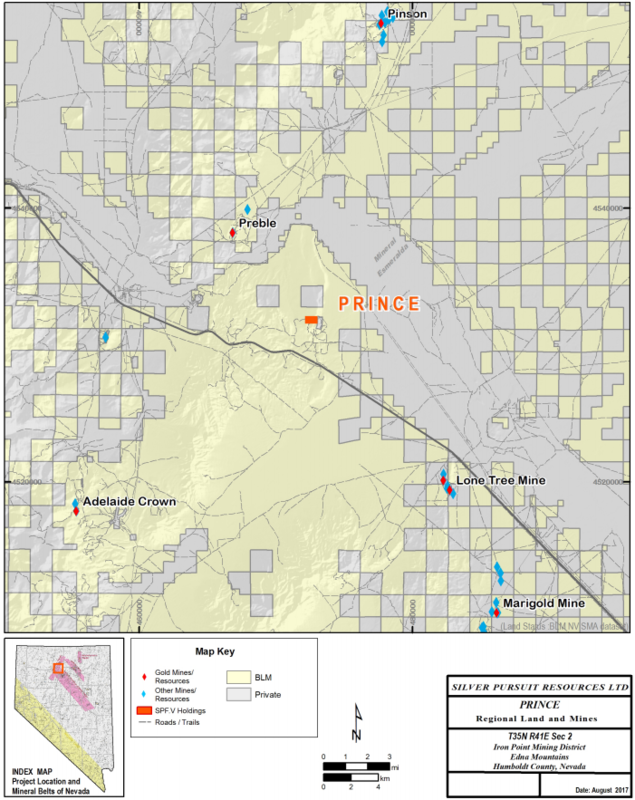 The land in the vicinity is checkerboard; patented mining claims are situated on the east boundary of the Prince claims at the Silver King mine. 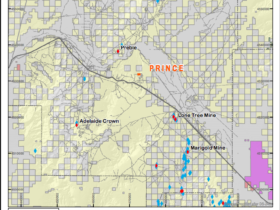 South of the Prince claims is the Silver Coin mine that achieved silver production in the 1920’s. 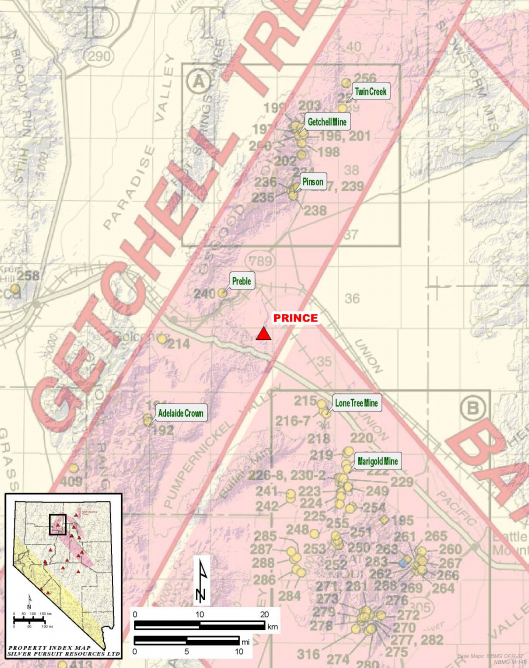 Geology at the Prince claims is mapped in some detail on the Iron Point USGS Geologic Quad (GQ-1175); the geologic descriptions are summarized here. The rocks are included in the Ordovician Comus Formation and on the north portion of the claims are onlapped by young basalt flows. 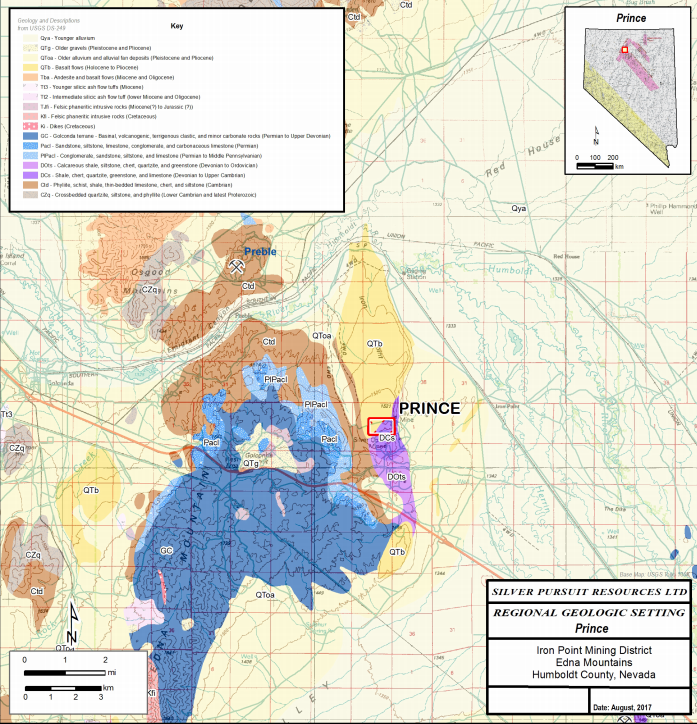 The Comus is comprised of shale and carbonate that are interfingered in such a way that where the shale is thick, that the carbonate is thinned and vice versa. In places, the Comus is intruded by Cretaceous diorite. The Cambrian rocks are regionally metamorphosed and have been intruded and locally have large scale contact metamorphism as well. 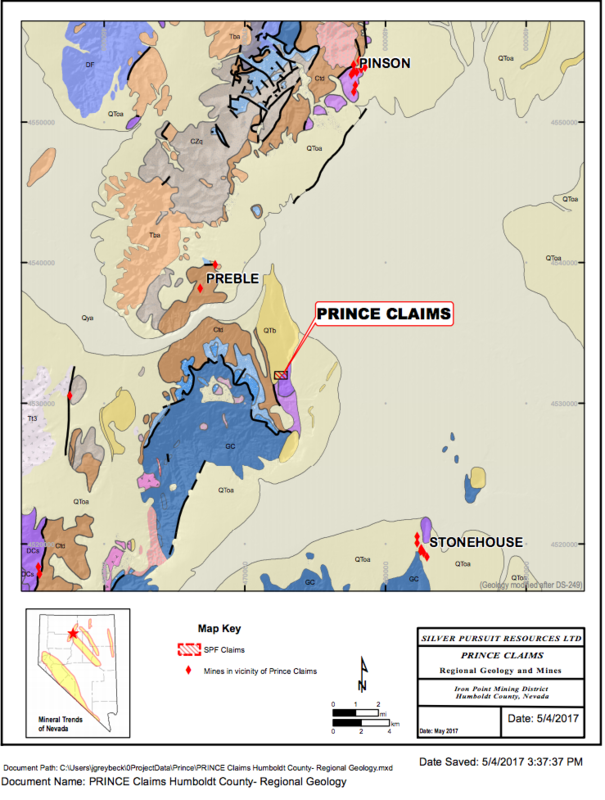 Cambrian-age Preble Formation is exposed in the north end of the Edna Mountains as a window of the lower plate of the Iron Point thrust fault and is fault-bounded to the east where Ordovician sedimentary rocks of the Comus Formation are present. The Comus has been subdivided by USGS mappers into five subunits. 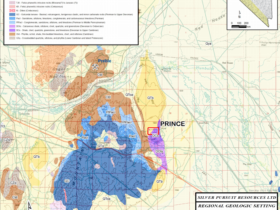 The lowermost unit is noted to be so broken and silicified in the vicinity of the Silver King mine that the original composition is uncertain. Breccias and quartz-rich shear zones occur along bedding or at low angles to bedding, particularly in the lowest subunit of the Comus. The character of the shearing suggests the unit has accommodated shearing along the thrusts by movement between the interbeds of the Comus rocks. The rocks are noted to be progressively more altered (silicification) southward into the Silver Coin mine area. The structure of the region is largely defined by the development of multiple thust plates that occurred during middle to late Paleozoic geologic history. The Iron Point thrust is a locally recognized feature that is apparently related to “pre-Sonoma Orogeny” deformation has folded Early Pennsylvanian to Early Permian rocks but not rocks of the Permian Edna Mountain Formation. This structure is not interpreted to have large displacement, but predates the Edna Mountain Formation that is recognized to be deposited from “highlands” developed in the Sonoma Orogeny. 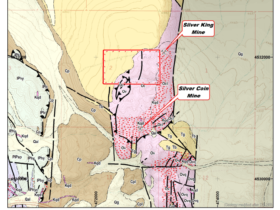 Minor production is reported for the Silver King Mine; the Silver Coin mine a half mile south of the Prince claims produced just over 30,000 ounces of silver from copper and gold-bearing material that occurs in silicified shear zones in the Comus Formation sedimentary rocks. The ore averaged forty to fifty opt silver. The underground mine workings were accessed by an inclined shaft some 165 feet in depth. 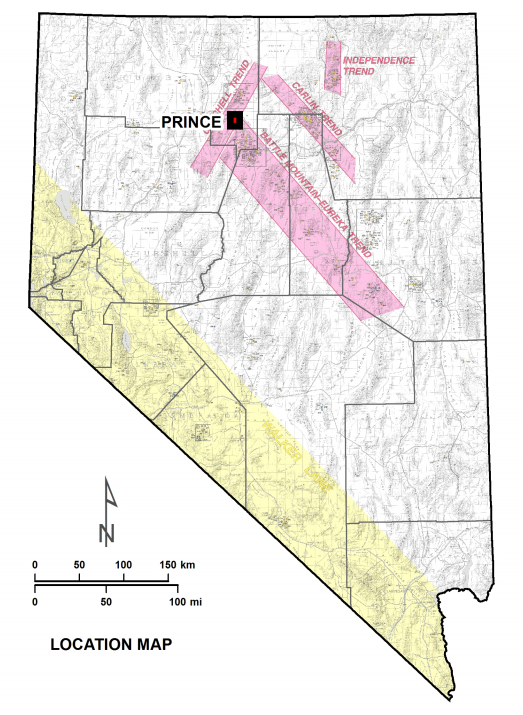 The surface effects of the mineralizing system are evidenced by a broad zone of silicification just south of the Prince claims and extends northeasterly with moderate to low west dips. 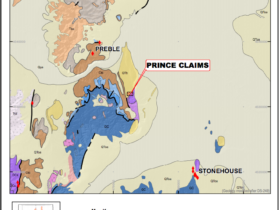 The altered zone projects beneath the Prince claims and it is thought that potential exists for zones of more gold-rich mineralization distal to the silver mineralization mined in the 1920’s. The silicification occurs as quartz veining and stockworks developed in sheared to brecciated, silicified limestone and black shale. 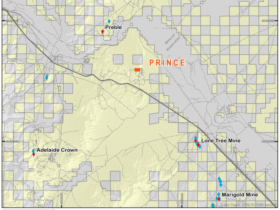 Geophysical surveys are proposed to determine the potential for deep targets that may be further investigated with drilling. A review of the geology is to be completed along with any past records that are attainable from past exploration on the current claims.